Miller's Y-Link Overhaul Balls are only - headache balls - on the market which use multiple angular contact ball bearings, instead of a common, higher-friction thrust bearing. Mounted above the overhaul ball, the low friction Y-Link swivel unit prevents both load and overhaul ball from spinning. Starting torque is relatively low and rotation will occur to 100% of load capacity. For added security, the design safety factor for the Y-Link Overhaul Ball is 5:1 minimum, versus the 4:1 design factor more typical of the industry. A direct lubrication fitting assures smooth operation and longer service life. The swivel unit is also user-rebuildable to 100% of original performance by using Miller service kits. Standard working load capacities to 35 tons are available, with overhaul weights up to 1450 lbs. One-piece weight ball casting -not a split casting. Available with eye, clevis, or with Miller's exclusive integrated wedge socket connection. See specs. 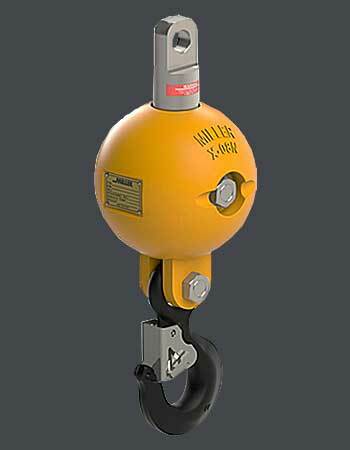 Heavier units are available for extreme lift heights.